Tradition says to decorate the egg. 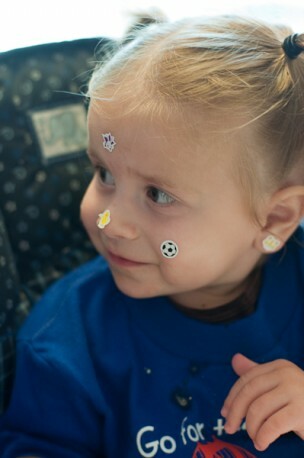 But after the blue dye spilled all over Marley and Mason had Autumn covered in stickers, we decided decorating the kids was a helluva lot more fun. Easter was a full blown weekend affair with egg decorating on Saturday and Easter egg hunts on Sunday. By the second egg of the hunt, Autumn had it all figured out and was looking for anything else the Easter Bunny might have decided to bring her beyond the bunny, dog (both stuffed), and stickers. She even got a smidgen of Scharffen Berger chocolate. 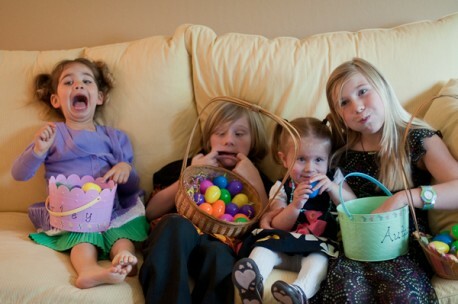 Next year she’ll build on her experience and will give her cousins a run for their money when it comes to the egg count. See more photos from our holiday here.